This April, Central Rappahannock Regional Library will be running our third annual trebuchet contest. A trebuchet is a kind of medieval siege engine. Full-sized ones were used to smash down castle walls. This contest will be a fun, family event, and you can join in by bringing your handcrafted trebuchet and testing it against your competitors! Launch It! will take place this year on Saturday, April 27, at Snowden Park off of Fall Hill Avenue. Registration will begin at 9:30 and the contest will start at 10:00. New to trebuchets? 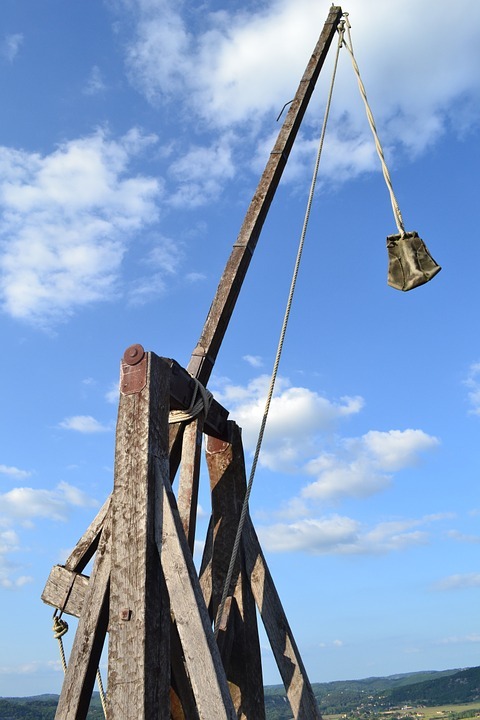 Join us for our Trebuchet Construction lessons at the Fredericksburg Branch, Tuesday, April 2, 9, 16, and 23. These are build-it sessions in the MakerLab. You must have a name for your device (trebuchet). For example, King Edward I's trebuchet was called Warwolf. The dimensions of your trebuchet may be no larger than 2 x 2 x 2 feet. CRRL will provide projectiles which are less than 2 inches in diameter. Projectiles must remain intact until they hit the ground. All trebuchets must be propelled by gravity (no springs, no elastics, no compressed air or water, no explosives). CRRL judges are the final arbiters on safety. Read all about last year's winners!